While I have read a few good fantasy books over the past year or two, I can't recall the last time I read a classic fantasy, with terrifying forests and fairy tale characters and castles and the like, let alone one intended for an adult audience that I enjoyed as much as The Book of Lost Things. The only similar stories my mind jumps to are by Cornelia Funke and Neil Gaiman. I am very picky about my fantasy, so I am always pleased when I can find a book to enjoy like this one. I liked that this book seamlessly integrated two different world settings: real-world war setting and struggling fantasy world. I know this is a popular thing to do (see Narnia) but I still enjoy the comparison between the two, the ideas of escape, etc. For me, both the world of WWII and the fantasy world are completely foreign so I enjoy reading about both despite the fact that I generally prefer to read about only one world at a time. So, the real world has to take a back seat to the fantasy world for me to really enjoy the story. The Book of Lost Things pushes that boundary a little further than I would normally tolerate (David doesn't enter the fantasy world until page 65) but you could say it's a testament to Connolly's prose that I didn't mind reading that far. Prose is such a finicky thing. When it's bad, there are a million different things you can say about how/why it is bad. When it's good, there are a lot of adjectives and terms that can be blanketed to apply to all types of good prose such as...flowing, effortless, like reading a painting, vivid, believable. These phrases can all be applied to The Book of Lost Things. This is one of the quotes I marked...I feel this a book that works better as a whole, just quoting fragments doesn't really do it justice. David nodded, but he did not feel reassured. In this land, it seemed that hunger inevitably overwhelmed cowardice, and the harpies of the Brood, as thin and emaciated as the wolves, looked very hungry indeed. I liked the hints (such as what he smells, his blackouts, hearing his father, etc.) throughout the book that informed the reader that perhaps David was in a coma or something similar. They weren't over hints, they don't bash you over the end or try to seem mysterious, but they are there - that best describes what I linked about the integration of such hints, they were just there without being distracting, confusing, etc. Another aspect of this book that I liked was the integration of tales and books. The stories talk to David, he explores his stories in his own personal adventure, he hears fragmented tales of familiar stories in his story. 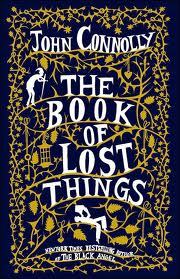 The Book of Lost Things contains many more tales than David's own and all are integrated well into the main thread. I also enjoyed all of the characters. It would be very easy to fall back on stereotypical characters in a classic tale such as this, featuring an evil trickster, a young boy hero, a woodsman, a knight, Snow White, etc. but Connolly twists them up just enough in his own unique way (a gay knight not going to rescue the princess but to find out what happened to the knight he loved, the seven dwarfs as oppressed working class members spouting Marxist theory, the Crooked Man who really is rather creepy and twisted), which is part of the reason this was such an interesting read. ...he lived there contentedly for many years, always answering his door to the children who called - sometimes with their parents, sometimes alone - for the house was very famous, and a great many boys and girls wanted to see it. If they were very good, he would take them down to the sunken garden, although the cracks in the stonework had long been repaired, for David did not want children crawling in there and getting into trouble. Instead, he would talk to them of stories and books, and explain to them how stories wanted to be told and books wanted to be read, and how everything that they ever needed to know about life and the land of which he wrote, or about any land or realm that they could imagine, was contained in books. And some of the children understood, and some did not.